Nurture animals and rebuild your farm in the wake of a hurricane. Harvest a bumper crop of thrills as you rebuild your farm in the wake of a hurricane. While caring for your animals and gathering the products they make, you'll learn a slew of amazing recipes and begin producing delicious dishes to be sold in town. Along the way, you'll foil the plans of the pesky ferrets who want to steal your goods. 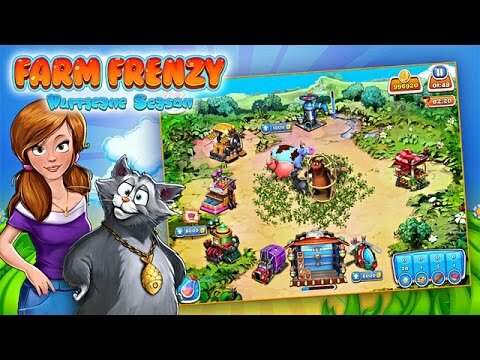 With dozens of exciting levels, vivid art and animation, and bonus features galore, Farm Frenzy: Hurricane Season is going to blow you away. Lead the animals of an abandoned island to provide for themselves. Save grandpa and grandma's wacky farm from foreclosure. Drop your axe and pick up your plow as you raise ye olde animals. Join Scarlett as she races to grow crops and raise animals before time runs out. Raise a variety of exotic fish and manufacture never-before-seen products.